1. WHAT IS THE COST FOR PROGRAMMING? Program options have varying prices. Things to consider for those varying prices are off site location, quantity of participants, details of goals, and custom designing. If you have questions about pricing details, contact us today! 2. HOW LONG IS A PROGRAM? We offer Half-Day programs that are 3 hours long. We can do Full-Day programs set at 6 hours of programming. We are able to do Multi-Day and Custom programming which can be tailored to your needs in reference to length of time. 3. WHAT FORMS WILL I NEED? Liability Release Form - please read, sign, and bring these forms to your program or complete online. If you have questions please let us know. Warm Weather: Shirts that are light colored and made from synthetic material will keep you nice and cool. Pants or longer shorts will be most comfortable in a harness. Closed toed shoes are required for participation. Sunscreen and a water bottle is a great idea to have during programming. Cold Weather: Layering is key. Long pants and shell jacket work great. A hat and gloves are great to have if you are outside for programs. Don't forget your closed toed shoes. 5. ARE THERE ANY WEIGHT RESTRICTIONS FOR THE ZIP LINE AND GIANT SWING? Yes, our maximum acceptable weight for both of those activities is 250 lbs. 6. WHAT IF THERE IS BAD WEATHER? Our programs run rain or shine. Please bring rain gear if necessary. In adverse weather conditions, BRLC facilitators will make the final decision regarding cancelations and will work with you to reschedule. 7. WHERE IS THE HIGH ROPES COURSE? 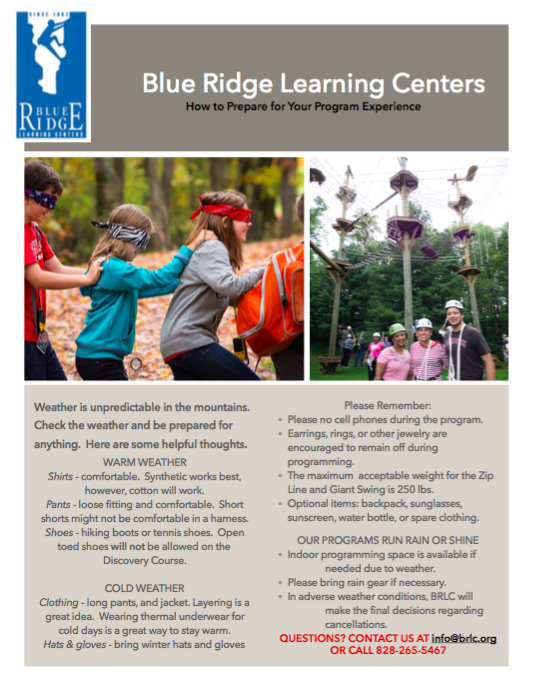 Our high and low ropes programming takes place primarily at the Blowing Rock Conference Center at 1818 Goforth Road, Blowing Rock , NC. But don't forget, we offer off-site mobile programming. We can come to you!